The high price of plastics raises the prospect of mining landfill sites and Rubbish is fast becoming the new gold as cost of raw materials rises. Now we’ve hit the economic buffers, the demand and therefore price, for recycled materials has, apparently, fallen through the floor. Leaving us with mountains of officially “recycled” rubbish and no way to deal with it other than landfill or ship it off to China. Not so, says IMechE. They have published a report [PDF 2MB] saying that waste is a resource that can be turned into Energy. Waste is not a problem to be dealt with, it is a resource to be used, just the same as we use natural waste products like coal and oil. Coal and oil are, after all, nature’s past landfills. IMechE bemoan the confusion between an EfW [Energy from Waste] plant and an Incinerator pointing out that they are NOT the same and explaining the difference. They point out that waste will still have to be streamed because only combustible or bio-degradable materials can be used and that metals and glass should still be reused or recycled. In Denmark they have local EfW plants which take waste from that community and then supply the community with both electricity and heating via large scale district heating systems; with quite a few being consumer owned. There’s a social novelty! And the proximity principle – saving on transport costs and therefore fuel. And these babies are energy efficient – unlike conventional power stations they trap and use the heat generated instead of just pumping it out to the local river or atmosphere, not that their remote locations lend themselves to heating a local community. And it’s not just Combustion. Back in August 2007 I posted on Breweries generating their own heat and electricity with a Combined Heat and Power [CHP] plant fuelled entirely by biomass including the spent grain used in the brewing process. This is described by IMechE as Gasification. Then there is Pyrolysis which produces a carbonaceous char, oils and combustible gases. Depending on the process, the oil may be used as liquid fuel for burning in a boiler or as a substitute for diesel fuel in reciprocating engines, although this normally requires further processing. And Anaerobic Digestion, a biological process used with liquid and semi-liquid slurries such as animal waste. Poo! But for some, Combustion remains a problem. Here’s Derek Wall on the subject. All very well, but there remains essential packaging for hygiene purposes and goods will still wear out. Not exactly “Zero waste” is it? This is akin to the pipe dream of perpetual motion. Zero waste is when there is nothing left over and all resources have been used productively. Left-overs being stuff that nobody wants and can’t think of a use for, has no value and is discarded. Using energy to get rid of it – “Incineration” or Landfill – is a Waste of that energy. 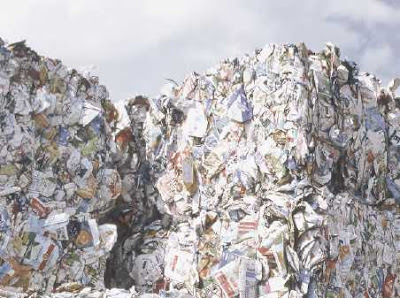 Reclassifying waste as fuel and using it locally to generate something useful like electricity and heating is Re-Use, the second tier of the waste hierarchy. Which brings me back to the beginning; these things are driven by economics and that, as we have seen, can change very quickly. Footnote: We still need Incinerators for Medical waste and what is the difference between an Incinerator and a Crematorium? It's probably illegal to dump your granny in an incinerator! If EfW can be done in Denmark, it can be done here. Does this include the paperwork from the big con versation?? Some of the Council's documents need pulping too!!!! Mention in this morning's paper that one of the Hampshire Councils has 3 state of the art waste incinerators providing electricity for 50,000 homes, and the ash is used for road repairs. Only 20% of all waste collected goes to landfill. Tut! They are not Incinerators, they are Energy Recovery Facilities! Which Paper? Clues please so I can find it on Tinternet. One only reads the Telegraph, my good man, and by heavens that's going down the tubes, dontcha know! Tubes or not, I tried that and couldn't find anything. An author maybe? or the title of the piece usually helps. I looked this up on google and found a company called integra which operates in Portsmouth, doing similar things to what Judith is saying about electricity produced and ashes being recovered for other uses. It was in the Correspondence columns. Incinerators in the UK waste around 80% of energy in the waste as heat up the stack. Recycling is many times better for reducing climate change than our waste burners. District heating is not viable in most of the UK. The only place it would be easiy to fit would be in new housing developments but they would be better built as low enegery eco homes that would not need the heat. The PFI waste incinerators cost the tax payer around £125/tonne to burn waste.